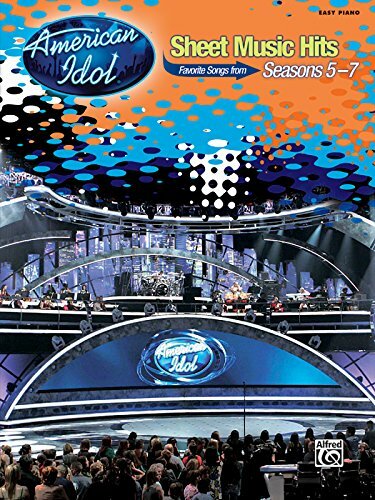 Play the top songs of American Idol sung by your favorite contestants from seasons 5--7! David Cook, David Archuleta, Katharine McPhee, Melinda Doolittle, Elliott Yamin, Chris Daughtry, Jason Castro, Kellie Pickler, Paris Bennett, Lisa Tucker and many other contestants brought these songs into the nation's spotlight. The Easy Piano arrangements are accessible for American Idol fans, young and old! Titles: Because of You * Bewitched, Bothered and Bewildered * Billie Jean * Come Rain or Come Shine * Don't Get Around Much Anymore * Go Your Own Way * Have You Ever Really Loved a Woman? * How Do I Live * I Believe in You and Me * I Don't Want to Miss a Thing * It Had to Be You * Mack the Knife * My Funny Valentine * Open Arms * Over the Rainbow * Over the Rainbow (IZ version) * Stand By Me * The Shadow of Your Smile * The Wind Beneath my Wings.